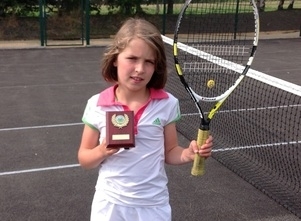 Rainford Tennis Club's Erin Scott has been chosen to represent Lancashire 9 & Under Team in the Aegon County Cup. Erin has been chosen as part of the team that will compete against Cheshire, Yorkshire and Derbyshire this weekend at Graves Tennis Centre in Sheffield. Well done, Erin, from everyone at Rainford Tennis Club and good luck in your matches!